Now that the weather is starting to get nice I've been wanting to start making some cute clothing for Sophia. I started by search different books and blogs for inspiration and came across Abbie at The Green Wife. 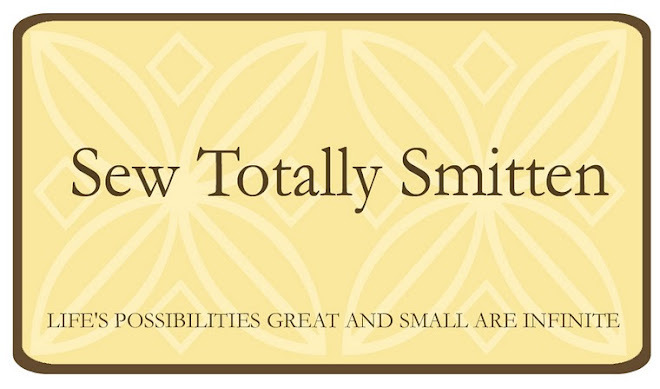 She has an awesome blog and tutorials. I'm now one of her many fans and followers! Abbie shared her toddler halter top tutorial and I just had to make one. She loves it and so do I! So while laying in bed last night I started to think about how I could take the same idea and change it up. I wanted to making one with ruffles all down the front. Here is what I came up with this morning. With permission from Abbie I will be using her tutorial with a few additions. When you cut your fabric, you’ll want it folded with the straight side of the pattern piece pinned along the fabric fold. Across the bustline is 12"
From top to bottom: 13″. Note: the five strips for the ruffles have not been cut yet in photo. Anchor one end of your elastic with a straight pin at one end of your casing. Attach a safety pin to the other end of your elastic and use the pin to feed the elastic through the casing. I forgot to take a photo of this but here is Abbie's so you can get the general idea. Make sure to secure both ends of the elastic by stitching vertically 1/4" from the edge of the fabric. To create the ruffles I found a little trick that work well every time without changing sewing feet. I change my machine settings to the highest tension and longest stitch. You should end up with 5 that look like this. Space and pin each ruffle in place. My placement was 2" apart. Working your way from the to to bottom, use a zigzag stitch to secure each ruffle panel. You will trim the extra length in the sides off after you sew them to the front. Make sure to leave about 1/2" over hang. Make sure to fold back and away each of the ruffles, you don't want what happened to me. Again every sewers best friend! Moving on. We are half way there! Bias tape, I made mine out of the same fabric. It's really simple and there are a few different ways you can make it. Abbie has a great video tutorial. Check it out! Sandwich the top (neckline) edge of the front halter piece within a 6″ length of bias tape ( mine 7"). Stitch along the open edge of the bias tape, being sure to catch the underneath layer in your seam. You’ll use the same basic idea to attach the straps. Start at the bottom of each underarm curve and attach your bias tape. 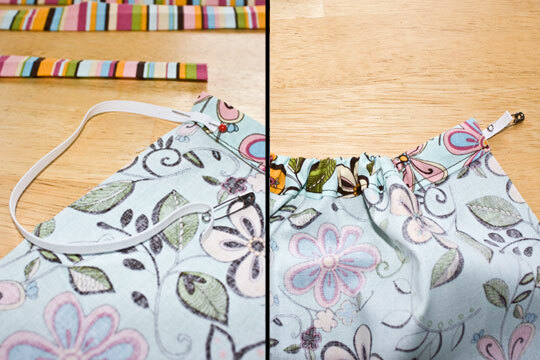 Sew down the entire length of the bias tape to close it and form the strap pieces. Grab your back panel and Pin your front and back together (right sides facing) at the side seams and sew 1/2″ seams. Do a final hemline on the bottom of the halter and your DONE! I completely LOVE what you've done with it! The ruffles are fantastic and I will definitely be doing this for Elliott. Thanks! I'm marking this to try, thank you! Thanks ladies! I'm pretty proud with how it turned out. I would love pictures of yours when your done. VERY cute! It would make such a cute dress too! I LOVE this. I will be on the way to the material store on Monday!! Thanks! How cute! Off to try this for my daughter! I love this. Thanks for the tutorial. I can't wait to try it! Wow - again, I am uber-impressed with your sewing skills considering I can't do a straight line on a large curtain. The top is super cute - how long did it take to make...it seems like a lot of steps - but that could be the clueless sewer in me. Oh my gosh I LOVE this ruffled halter top! I haven't used or made bias tape before because it intimidates me! :) But I will have to try. This top really is boutique-worthy!! Good job! I'm going to be following your blog. We seem to be sewing the same types of things for our little ones. Keep the posts coming! very cute! thank you for showing us how to do that. This is such a great little top! Wonderful tutorial! Thanks so much, it was a nice, easy tutorial to follow and I'm sure I'll be making more! Made one - it turned out so cute! Thanks for the pattern. I think it would work better, though, to hem the body pieces before putting them together; I had trouble doing it after sewing them right-sides together, and had to rip out my seam to hem them. Also, in your instructions on top you specify bias tape for the hem, but then we never use it. I would like to make a the bias tape wider (1- 1 1/2 " wide) to make the bow in the back bigger and drape a little more. Would I just subtract the additional width off of the neck/bust and length of the back pieces? How much fabric do i need to make this?